This week I found out how to perform matrix multiplication using SQL. I don’t think I’ve touched matrix multiplication since university so first I gave myself a quick refresher in the mathematics. To multiply two matrices (A x B), e.g. First, determine the size of the resulting matrix which will have the same number of rows as matrix A & the same number of columns as matrix B. To get each result, find the row from A & column from B that overlap at the result cell. Therefore, to get the upper left result, use row 1 (A) & column 1 (B). To calculate the result, sum the product of each matching pair. Likewise, to get the upper middle result, use row 1 (A) & column 2 (B). To get upper right result, use row 1 (A) & column 3 (B). To get lower left result, use row 2 (A) & column 1 (B). To get lower middle result, use row 2 (A) & column 2 (B). To get lower right result, use row 2 (A) & column 3 (B). These calculations give the resulting matrix. To perform this matrix multiplication using T-SQL, create two tables to hold the matrix data. 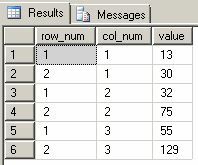 In this schema, row_num corresponds to the row of the matrix, col_num corresponds to the column of the matrix & value is the value held at this cell. Populate the tables with the data from matrices A & B. To multiply the two matrices, join the tables matching col_num (A) to row_num (B), group by row_num (A) & col_num (B) & sum the product of the values. If you want to determine the value for a specific point on the result matrix, add a WHERE clause, e.g. Matrix multiplication using SQL is particularly useful for sparse matrices (where many of the values are zero) as you only need to store the non-zero valued entries in the tables. One application for sparse matrix multiplication is to determine similarity patterns, e.g. in shopping lists so that that a retailer (like Amazon) can highlight on a product page what other products have been bought by customers who also bought this particular product. To do this, create another table to hold a matrix, e.g. Populate it with Products that Customers have bought & the number of times they have bought them from this retailer (the PurchaseCount). To find what other Products have been bought by Customers who have also bought Hats (and how popular those other Products are), use the following query. Likewise if, a customer was searching for Gloves & Mittens to maximise their chances of finding the best Product to keep their hands warm, you could create a view with the data from ShoppingFrequency & a dummy “Search” Customer corresponding to the Product search terms “Gloves” & “Mittens” to find which Product is most popular. I'm trying to become "better" at SQL Server and other data technologies - here's how I'm doing it!